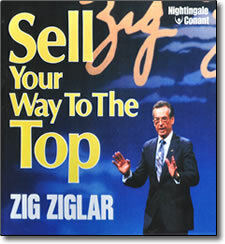 Zig Ziglar has been in the trenches in selling — and it shows. His insights and techniques are right on. He knows where you’ve been and how you can achieve the sales success that you dream about. In this unabridged version of Zig classic sales training seminar, you’ll find the secrets — the skills, attitudes, and techniques — you need to become a true sales professional. Capitalizing on his vivid storytelling abilities, Zig Ziglar tells you about the time he bought a new car. Throughout this fascinating account, he weaves in 25 professional sales secrets that could lead you to greater sales success. Zig explains the H-E-A-R-T acronym. You learn the importance of honesty, ego and empathy, and attitude. Zig then discusses the three kinds of reserve you must have to be successful (physical, mental and spiritual), and how toughness applies to selling. The best way to apply selling psychology is to view everything you do and say from your buyer’s standpoint. You learn to fulfill buyers needs, to ask prospects how they feel (not what they think), and add 12 additional lessons that help you put a new spin on your sales presentations. Your voice is a powerful selling tool. Zig shows you how to use it correctly and effectively, no matter what the situation. Combining the proper voice inflection with the right words and the right intent will make you a winner. The first five keys are: positive projection, an assumptive attitude, physical action, enthusiasm, asking subordinate questions. You’ll learn to use the C-H E-F method to interpret favorable body language among prospects. The remaining 6 keys are: effective listening, persistence, citing an impending event to boost sales, inducement, sincerity, and using narrative stories. Positive words to use: negative words to avoid. Capitalizing on your natural skills and abilities. You’ll learn to paint powerful verbal pictures, using exactly the right words. Then you paint your prospect into the picture. Then you give hope. Finally you close. Using colorful word pictures, Zig shows you how questions can lead your prospects to buying decisions. He also provides you with two principles for effective questioning. Learn the two reasons why people don’t buy, plus more! The difference between questions and objections. Why you needn’t answer all objections. How to handle recurring objections. When to handle objections. A six-step process for demolishing objections. Dealing with antagonistic prospects. Zig shows you why closing is an attitude. he tells you that believers are closers. You learn why you should never attempt to close until after you’ve established value. Finally, Zig shares some winning closes with you. Making yourself a part of your prospect’s world. Preparation. Imagination. Dramatization. Capitalizing on the fear of loss. The signature close … the tennis racket close … and more. When to use both logic and emotion. In this motivational session, Zig pulls out all the stops as he closely examines the selling profession and its contribution to mankind. He believes that how you feel about the sales profession will greatly influence your career. And he makes you feel great about selling! Zig Ziglar is an institution, both in spirit and in fact. Sales managers everywhere love Ziglar because he reinforces their teachings. And sales professionals can’t get enough of Zig Ziglar because he tells it like it is and makes them proud of selling.